You will find Asheville and many places in the North Carolina mountains to be very pet-friendly. Since so many travelers bring along their canine companions, here are some helpful tips and resources. In addition to parks, there are many pet-friendly businesses in downtown Asheville. 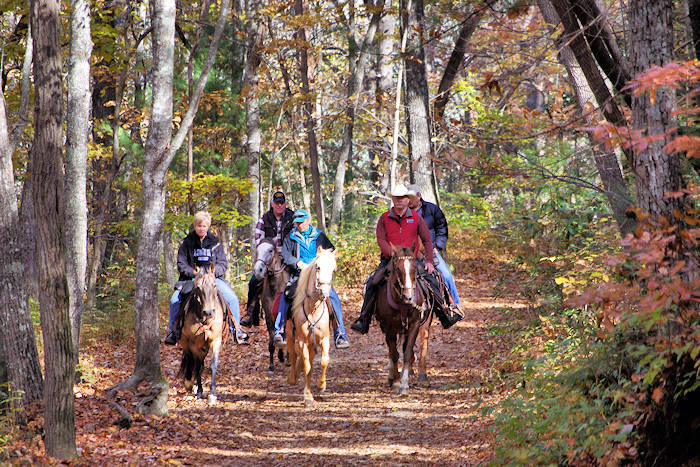 See our top places to visit on the Dog City USA trail. 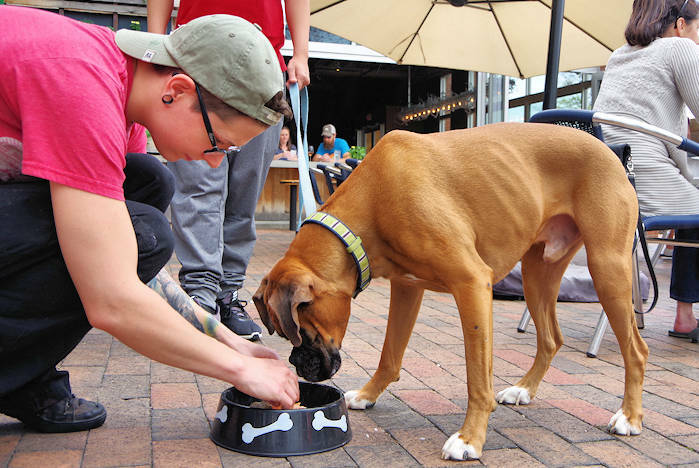 During warmer months, many restaurants, breweries and coffee shops have outdoor dining that welcomes dogs. Walk the Urban Trail with your dog. Most festivals do not allow dogs since areas can be very crowded. The grounds of Biltmore Estate are perfect for walking your pets, but please make sure to keep them securely leashed at all times. Naturally, pets are not allowed inside Biltmore House or other Estate buildings, such as the winery, restaurants and shops. At Asheville Outlets, shop 75 national and local outlets in this beautiful outdoor shopping village. It's located on I-26, just six miles from Biltmore and seven miles from downtown Asheville. The common areas are very dog-friendly (stores vary). One of Asheville's most beautiful parks, the French Broad River Park features open green space with old trees, a paved trail, riverside observation deck, picnic tables and grills. The Dog Park features a large fenced-in one-acre area with water and poop bags provided. Located at 508 Riverview Dr.
Take a downtown Asheville tour with your dog, starting with the Doggie Welcome Center, then to a bakery and have lunch from a dog menu! Read more about Dog City USA. 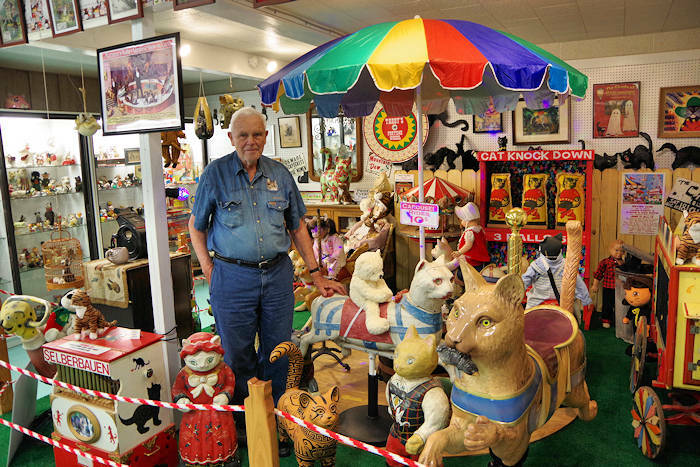 New is a very fun, quirky small museum packed with 10,000+ curiosities that "CatMan2" has collected for the past 30 years. Located near Dillsboro, it funds a nearby no-kill cat shelter. Read more about the American Museum of the House Cat. Tip for Lodging: Call and ask plenty of questions about pet policies/fees, facilities and places to walk your pet. Ask about pet sitters (avoid leaving your dog alone in a strange room). Keep your pet leashed outdoors and in all public areas. Campground for Dogs: 4 Paws Kingdom Campground near Rutherfordton is the first and only dog-dedicated campground (campers & RVs), with a fenced-in swimming pond, off-leash play areas, agility park, doggie bathhouse and more. If you don't have an RV or camper, rent one or a cabin. It's like summer camp for dogs! Adult owners only - 18 years or older. Dogs on the Blue Ridge Parkway: In addition to being a great place for a dog to hang its head out the window and enjoy the fresh mountain air, dogs are allowed on the more than 100 varied trails throughout the Blue Ridge Parkway. Dogs and other pets must be on a leash or under physical restraint at all times while along the Parkway. 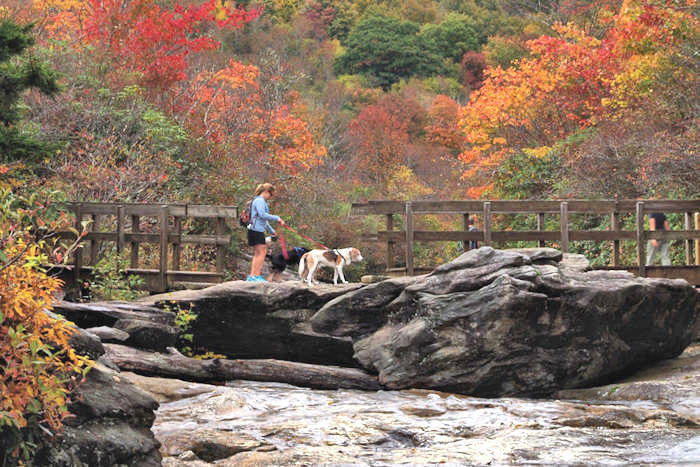 Dogs on Hiking Trails in the National Forests: You can take your dog on any of the hiking trails in the Pisgah National Forest and Nantahala National Forest, including to most waterfalls. Be extra careful of letting your dogs get into the water of a rushing stream or waterfall! Dogs may not be left unattended, and they must be leashed and cleaned up after. Dogs are not allowed in buildings. The camping and tent areas also allow dogs. 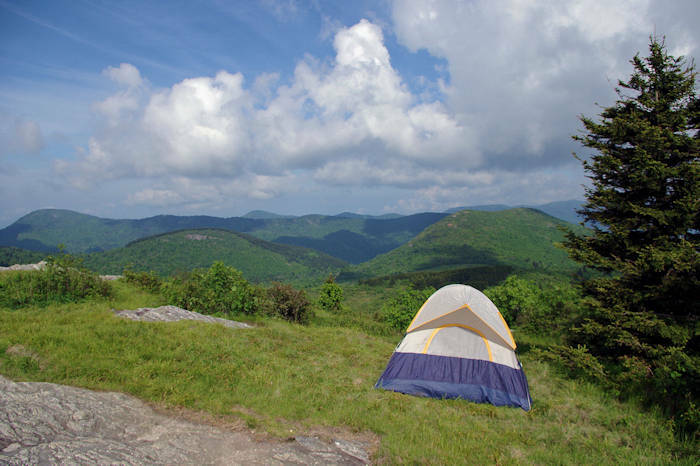 Read more about camping. Dogs can carry disease into the park's wildlife populations. Dogs can chase and threaten wildlife, scare birds and other animals away from nesting, feeding and resting sites. The scent left behind by a dog can signal the presence of a predator, disrupting or altering the behavior of park wildlife. Small animals may hide in their burrow the entire day after smelling a dog and may not venture out to feed. Dogs bark and disturb the quiet of the wilderness. Unfamiliar sights, sounds and smells can disturb even the calmest, friendliest and best-trained dog, causing them to behave unpredictably or bark excessively. Pets may become prey for larger predators such as coyotes and bears. In addition, if your dog disturbs and enrages a bear, it may lead the angry bear directly to you. Dogs can also encounter insects that bite and transmit disease and plants that are poisonous or full of painful thorns and burrs. Asheville Humane Society is dedicated to the respectful, humane treatment of animals and to providing helpful animal services to the people of our community. Brother Wolf Animal Rescue: Visit their community adoption center and Second Chance thrift store, located at 31 Glendale Avenue in Asheville. Open seven days a week (Monday-Saturday from 8 AM-8 PM, Sunday 8 AM-6 PM), with many cats and dogs looking for homes.